I believe this to the depths of my being – most days. If I am completely honest, it is often hard to “behold” this truth now that she is firmly ensconced in teenage angst. The most difficult times? When I “beholding” an empty wallet, when I “beholding” all of her prized possessions I have found scattered around our house, when I “beholding” my temper while attempting to shop with her (I wrote about that here), or when I “beholding” my tongue while she sasses me or insists for the 187th time that she knows better than me. Ugh. If I could choose to only ever communicate 2 things to my 13 year old, I would let her know that #1 – she is wonderfully made by a Savior who adores her wants to be with her forever, and #2 – that her dad and I love her madly and are ALWAYS, ALWAYS, ALWAYS in her corner. What often comes out instead is some horribly timed and messy variation of, “why can’t you do better!? !” I could crawl up in the fetal position to think of the ways my flesh gets the better of me and my words wound instead of heal. But balling up with a gallon of Blue Bell (Come on now. If I’m in the fetal position, there is ice cream involved.) 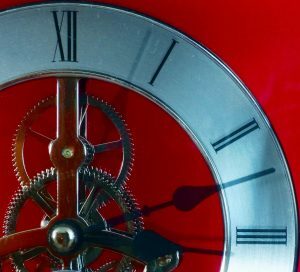 won’t turn back time – as much as Cher might sing about it. Hopefully I didn’t just give you the ear worm I now have. The truth is, my kid is kinda over me. She loves me because I’m her mom and I’m thankful I still get hugs and kisses, but she currently takes most of her cues from people other than me. Willingly, at least. 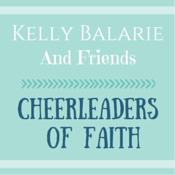 She listens more to friends, youth ministers and other influencers than to her family. I often imagine that she hears Charlie Brown’s teacher when I discuss something with her. But even if she’s not as inclined to listen, I’m not done guiding her. And I’m specifically not done filling her with the 2 important messages I listed above. So I’m trying to get more creative in attempts to connect with her. Here’s what I know. Grand gestures embarrass her now. I could spend a lot of money on taking her some place cool or buying her things. She *might* have an appreciative reaction, or I *might* end up feeling unappreciated and dejected. So I’m opting right now for small, repetitive tokens of my affection. Here are the two things that seem to be working for me right now. When I was in college, I decided it would be cool to have one more piercing in one ear than the other. Asymmetrical ear holes was the extent of my “edge” back then (and maybe now). So when I jewelry (can I use that as a verb? ), I wear a pair of earrings and then one lone stud or small hoop. My daughter’s middle name is Rose. 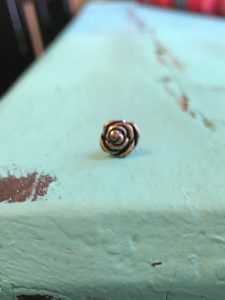 I have this Rose stud that reminds me of her every time I wear it. 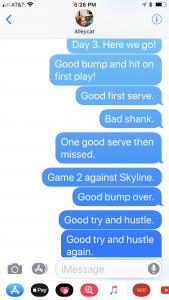 I open my text thread to her at the beginning of the game and keep a running commentary of every time she touches the ball or encourages a team mate. As you can see, the feedback is not always glowing, but it’s mostly positive and lets her know that I see her. And I’m proud of her no matter what. She knows how closely I paid attention and she likes it! when her room looks like a natural disaster or her tone implies that I am using my last living brain cell. What creative ways do you connect with your teen? I would love more ideas. Comment on this post and be a part of the conversation! Having teens and lots of them. This is a very thoughtful and encouraging post. Thanks for sharing your heart. I went through my time with 6 teenage daughters, 3 of my own & 3 step daughters…ohhhh…what fun!! And I am an Adolescent specialist! Ask your daughter what one on one time suggestions she would suggest, when she’s in a happy mood that is & do these once a month…even though they make sounds like they are dying & bored about these one on one times, they secretly LOVE it & they will tell you that…in ten years time! Lol! You’re always welcome to drop by for a cup of inspiration anytime! I found that volunteering together has been a win win for my girls and I. We found places they enjoyed and tried to volunteer monthly together. This allowed us time together without the focus on “us”. I tried to include a lunch or dinner around the volunteer time to gain more together time. Sometimes it was just picking up a Sonic Milkshake afterwards. Great idea, Cory! Love it. a great reminder to hang on to is that 13 will become 18 and then 25 before you know it and she will be out on her own (just like my oldest now) I still have one daughter at home (16) and have some of those challenges, but I work hard at always being on her side and spend time just talking with her as much as possible, knowing from experience now, that the hormones will settle and she’ll grow up soon. She has her license now but still asks me to go with her from place to place every now and then, and even though it’d be easier for her to go alone, I go anyway. In the car is a great place to just have one on one conversation… and I know that one day she won’t ask me to go anymore. so even though the middle school years are rough, remember that time under your roof will come to end fast. as Ephesians says “make the most of your time, for the days are evil” blessings to you! What a great reminder, Karen. And car time can be good time. Good tip. Thanks so much for joining the conversation! loved this – i have 3 girls – now in their 20’s and we are pretty much in love with each other (tho there are times…) you are doing a great job! love the texting stream and I remember those club weekends… A tip that helps me: to ask their advice on something and try to follow through. they are trying so hard to “adult” and we need to let them practice where it’s safe. great post! Ask their advice. What a great tip, Sue! I love it. Thank you so much for sharing. Ah, I wish I had had your wise and sane perspective back in the day of parenting teens. You give me too much credit, Linda. I wish I could say I’m always peaceful. It’s all a journey. Lauren, so good to connect with you!! I absolutely loved this! 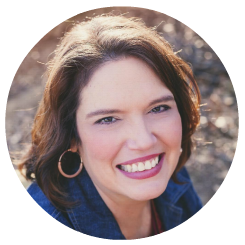 I LOVE the ideas you came up with to encourage and support and ultimately connect with your teen! Way to go mom! It does take some effort and thought, doesn’t it? Teens are a different breed. Ha! I LOVE my kids, but things sure do change when they become “that” age. And it always seems to happen overnight! You’ve encouraged me to give a little more thought in how I can connect with my own children! You have made my day, Rachel. And I needed some encouragement. My little girl has her first broken heart and is making the rest of us pay for it! Ugh. I wish we lived close enough to get together but it’s a far skip to me here in Texas! Glad we can connect this way, though.